The honour of being YouTube's Most Subscribed channel used to be a battle before the days of Pewdiepie - and here are all the contenders. Over the past few years, we've kind of accepted the reality of PewDiePie's unbeatable lead as the Most Subscribed YouTuber of all time. But some of us can remember an age of YouTube where you might have asked "Whodiepie?" (Sorry). Because honestly, a few years ago, the honour of being the biggest channel on YouTube was a neck-and-neck death match. But who were the contenders? Thankfully, a genius on Reddit has compiled every "Most Subscribed" channel since 2006. Redditor "davidjl123" has posted a series of infographics, that chronicle the ups and downs of the top 10 channels since the community's earliest years. 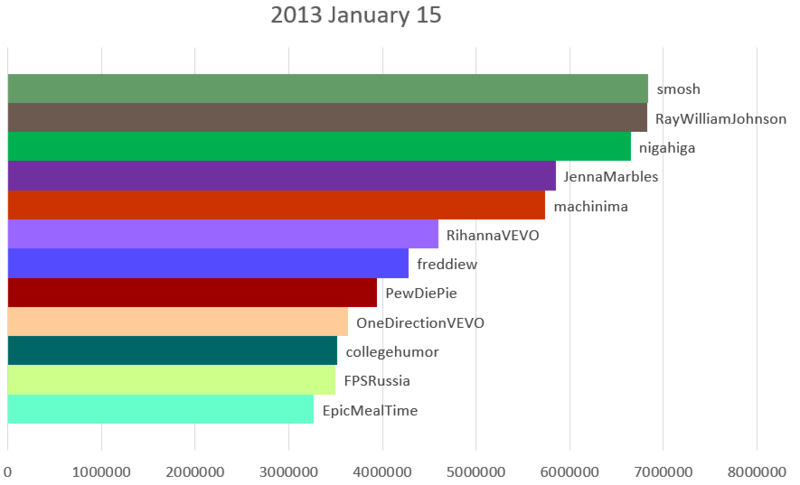 The most interesting thing is that wacky duo Smosh have taken the top spot 3 times - but never in consecutive years. Also worth noting is just how small channels were in comparison to today - while still qualifying for a "Most Subscribed" ranking. While Pewds boasts a 50 million-strong channel in 2017, Smosh sat at the top with only 3,000 subscribers in 2006. Also, what happened to literally all these other channels? You can view the entire timeline of the Most Subscribed channels here.